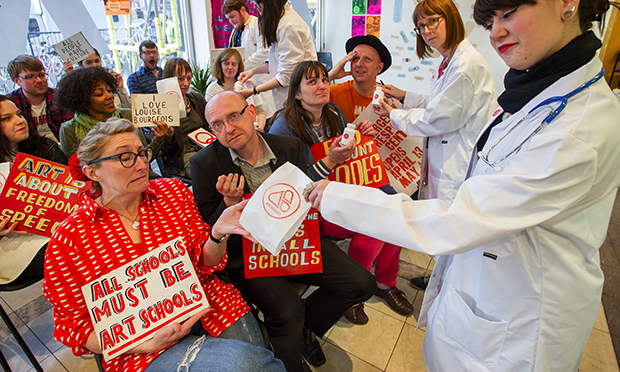 More than 2,000 people have signed a petition against plans to close an art school with “deep roots” to East London. Last month London Metropolitan University approved plans to consolidate all teaching to its Holloway Road campus, allowing its buildings at Moorgate and Aldgate to be sold. The Cass Faculty of Art, Architecture and Design, on Commercial Street, described as the ‘Aldgate Bauhaus’ by artist Bob and Roberta Smith, will have to relocate to Holloway Road by September 2017. Mayor of Tower Hamlets John Biggs said he was “deeply shocked” at the decision to relocate the campuses. “The loss of all the student places in the Aldgate area is a blow, but the decision to relocate the Sir John Cass Department of Art, Media and Design is particularly upsetting,” the Mayor said. But Professor John Raftery, Vice Chancellor of London Met, defended the decision, saying: “We are excited about this project, which aims to create a one campus, one community university. “We believe this will benefit our students, who will enjoy an enhanced student experience, and our staff, who will have more opportunities to collaborate. A change.org petition led by Cass Faculty Officer Amanda Marillier has already attracted over 2,000 signatures. “The proposed closure of The Cass and Moorgate campuses represents a massive attack on students, staff and access to education,” the petition states.